A few weeks ago I attended the 2012 Space Elevator Conference in Seattle and met Michael Laine, who heads up the Liftport Group. Michael setup a Kickstarter campaign to secure funds for some basic space elevator research. His group is interested in the concept of an elevator on the moon, not Earth, which could be used to allow soft-landing of ships and cargo on the moon's surface, and fling ships and cargo at high speed into the outer solar system with minimal fuel. The campaign's initial goal of just $8000 was quickly met, and has since exploded to almost ten times that (thanks in part to David Brin mentioning it during an NPR interview). This of course earned a lot of attention from the press (the headlines they've come up with are cringe-worthy, but that's typical). Why such a small goal? One thing Michael understands is the need to take baby steps in order to accomplish the larger goal, and basic research is needed in many areas. And while most of the speakers at the conference also understand this, their approach seems entirely focused on securing government or university research grants. From what I've gleaned, Michael is something of a trailblazer and the use of Kickstarter to fund research certainly qualifies. Congrats, Michael, on your success! I have an update on release dates. 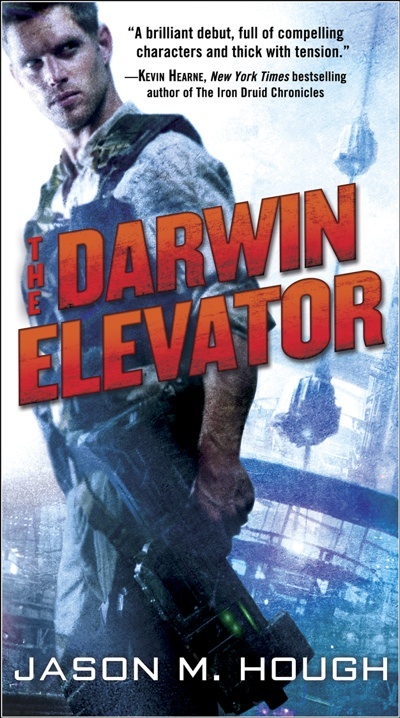 Del Rey has decided, with my blessings, to push out the release date of THE DARWIN ELEVATOR from February 2013 to July 2013. Yes, that's right, all three books will be out in a 3-month span. This is a release model they've tried with other authors recently and it works very well, so they asked if I'd mind going with the same model. They're pushing DARWIN out a bit to give me the time I need to finish Book 3. Waiting isn't fun, but the benefits are there. DARWIN might be five months later than we'd all hoped, but the third book will be six months earlier. It turns out that readers, especially the "gimme NOW!" eBook contingent, respond well to getting the next book in a series quickly. In addition to that, it lets Del Rey put all their marketing oomph into one big meta-release. As an author who wants to sell books, I like marketing oomph. They chose July to coincide with Comic-Con next summer and continuing over August and September. This gives the series a lot of love while the spotlight is hopefully on it, a win for all involved. It also means Comic-Con 2013 will be awesome. Want to name a character in my series? Or a vehicle maybe? I'm auctioning off just that, plus a few other things like a query letter critique, here. All proceeds go to diabetes research! I just received word that THE DARWIN ELEVATOR has been approved by my editor at Del Rey! Now it's off to layout design and copy editing, then proofreading. After that, the fun stuff like cover design, marketing... I can't wait! I also can't rest. BOOK 2 (that's just a working title) is about one-third of the way done, and on schedule. It's nice to know that I can focus solely on that now, as I've been bouncing between the two manuscripts for the last month or so.